The Hive to Spark node imports the results of a Hive query into an Apache Spark DataFrame, keeping the column schema information. An Apache Spark DataFrame is a dataset that is stored in a distributed fashion on your Hadoop cluster. In this example, the Spark Partitioning node first splits the DataFrame into training and test data. The training set flows into the Spark k-Means node that trains a clustering model (using Apache Spark's MLlib) on the data and hands it to the Spark Cluster Assigner node. This node uses the model to label the previously unseen test data. Finally, the Spark to Hive node stores the labeled data back into a Hive table. The Spark to Table node imports the labeled test data into KNIME Analytics Platform. See KNIME Extension for Apache Spark in action! We highly recommend watching this video to get a feel for what you can do with KNIME Extension for Apache Spark. You need to install (i) a client-side extension for KNIME Analytics Platform and (ii) the cluster-side Spark Jobserver. Please consult the installation guide for details. 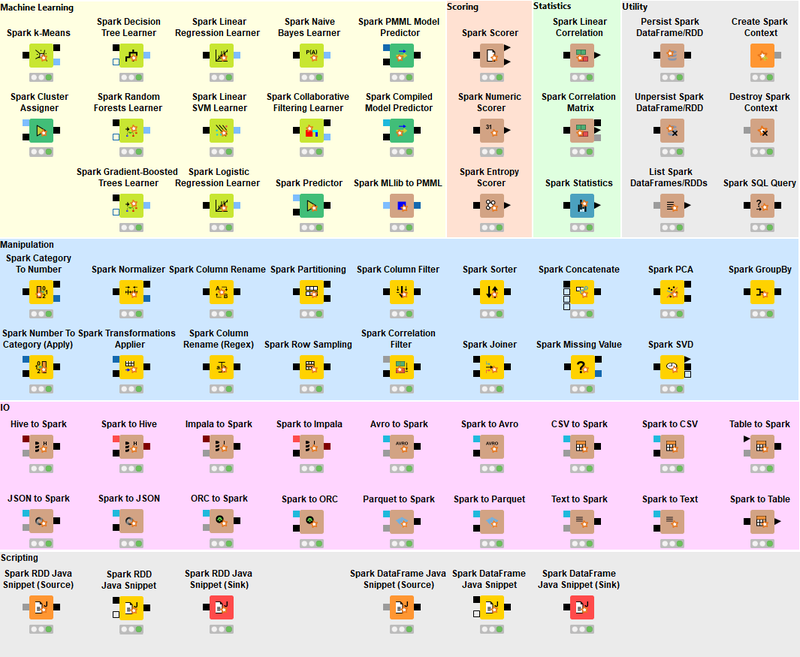 Note: You need to pick a version of Spark Job Server that matches your Hadoop installation. Note: This version of KNIME Extension for Apache Spark requires a license. Please contact sales@knime.com. Note: You need to install a version of Spark Job Server that matches your Hadoop installation. Note:You need to install a version of Spark Job Server that matches your Hadoop installation. All third-party trademarks (including logos and icons) referenced remain the property of their respective owners. It does not indicate any relationship, sponsorship, or endorsement between KNIME and the respective owners. Any references made is to identify the corresponding goods or services and shall be considered nominative fair use.